Stand-Alone proximity reader with optional Barcode and Magnetic Stripe, for use in Access Control and Time & Attendance. The Smart Prox STA is a stand-alone Proximity reader for use in both Access Control and Time & Attendance. The Smart Prox STA can be ordered as a proximity, proximity/magstripe combination, proximity/barcode combination, or proximity/magstripe/barcode combination. With 128K of memory and an internal relay, the STA series is a low-cost solution for controlling door access or gathering Time & Attendance information. The reader contains 128K of memory (512K optional), which is enough to store 6000 9-digit employee numbers. The reader can be downloaded with valid employee numbers from a PC, or enrollment of cards can be done directly at the reader. "Schedules" are also supported in the reader, so that access can be limited to specific days and times for each employee. Each employee scan in the reader may optionally be recorded into the internal memory of the reader, along with a date and time stamp. This information can then be uploaded to a PC at any time. Invalid scan attempts may also be logged. All you need to control a door is to install the Smart Prox STA with an electric strike or magnetic lock, and you're up and running. 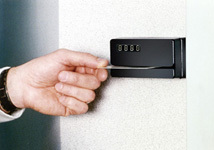 The Smart Prox STA supports proximity cards by Farpointe and Hid. For access control which requires monitored access, such as employee ID verification at guard shacks, the STA reader is also available in a portable version with an internal battery. The Smart Prox STA also supports the connection of an external proximity read head. With this option, you can add the flexibility of IBC's STA series readers to your current system using your own proximity head.